You’ve designed structures with HSS products throughout your career and enjoy using them – whether it is their greater design properties in both axis, or how they are particularly suited for compression column applications, HSS’s popularity continues to grow every year. And whenever we have tours at one of our manufacturing facilities across the United States, I always get questions about how HSS are made and the specifications the material is produced to. On a recent tour, a good question came up about why the yield point for round HSS is different from square and rectangular HSS. Sections manufactured to the ASTM A500 specification have a different minimum yield point that depends on the shape of the section. The min yield for a round HSS manufactured to ASTM A500 Grade C is 46,000 psi. ASTM A500 Grade C for squares and rectangles is 50,000 psi. Since the two products are often time manufactured on the same line from the same coil, why are the minimum yield points different? Well, it has to do with the cold working required to produce one size to the next. Cold working, or strain hardening, is what happens after hot-rolled steel has reached and passed its yield point. 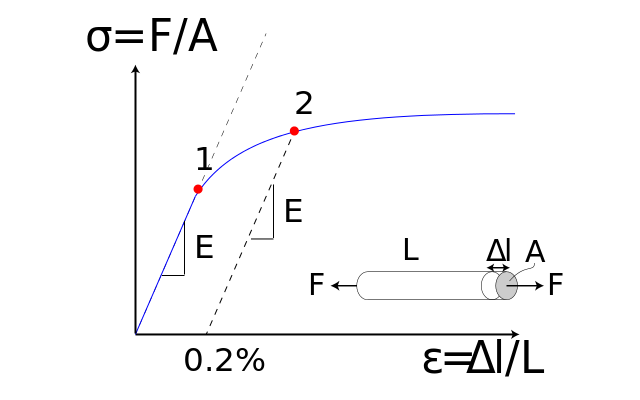 If you refer to the stress-strain plot for a piece of steel subjected to a tensile load, you can see the distinct point at which steel yields. After this point, the steel will continue to gain strength but at a faster rate of strain. This is the region where strain hardening occurs. In the production of HSS products, a flat coil is formed into a round shape through a set of rollers and dies on the mill. The steel coil has actually reached the yield point and begins to gain strength through strain hardening during this production of a round shape. After the material is electric resistance welded and cooled, it is cold worked through a second set of sizing stands to the final shape – a square, round or rectangle. Since there is more cold working involved in the process to manufacture a square and rectangle compared to a round, the defined yield point of the cold-worked steel is higher for squares and rectangles compared to rounds. Would you like to learn more about how we make Hollow Structural Sections? I offer a lunch and learn where I go into a deep dive on how we make our products – it’s even better if you can pair it with a mill tour at one of our many locations! If you have additional questions on HSS or A1085, please email me anytime – I love talking to my peers about HSS!